When Merchant of Secrets enters the battlefield, draw a card. Adarkar Valkyrie and Exclusion Ritual are the only cards I can see right now that aren't too helpful. 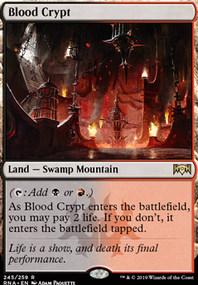 Here are some suggestions: Oracle of Dust , Murk Strider , Ulamog's Reclaimer , Strionic Resonator , Naban, Dean of Iteration , Reality Acid , Wall of Omens , Meteor Golem , Nevermaker , Angel of Serenity , Diluvian Primordial , Flickerwisp , War Priest of Thune , Ichor Wellspring , Mycosynth Wellspring , Trial of Knowledge , Harbinger of the Tides , Merchant of Secrets , Champion of Wits , Deadeye Navigator , Sower of Temptation , Exclusion Mage . Gonti, Lord of Luxury is one of the strongest ETB effects in black. 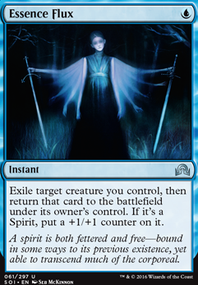 Also, Altar of the Brood goes infinite with Aminatou and Felidar Guardian, making it a must-have. Clever Impersonator seems to be an upgrade over Body Double. Merchant of Secrets and Skyscanner seem to low impact in my opinion. 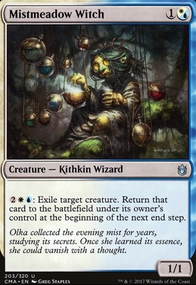 enpc what's another cantrip creature with a cheap cmc other than Merchant of Secrets that is in U/W? And I cannot bring myself to dump Conjurer's Closet due to it being a repeatable blink effect and a secondary Venser, the Sojourner of sorts. You are probably right, Teferi's Veil might be too unreliable. You really put together a deck that is consistent and every card is well chosen.My deck is a bit less focussed, but that's to a certain degree on purpose. It wins with the same combos that are often availabe through tutors or insane card draw, but has a more diverse and agressive style, but less control (and artifacts). Marchesa, the Black Rose is in there, which seems fun with Teferi's Veil. You hit harder every time your tokens survive. But we mostly play multiplayer, so you can attack an opponent with less/smaller blockers. That's one reason why I don't play fully competitive, but also with some fun elements.Both altars at the same time are not the worst thing to have. 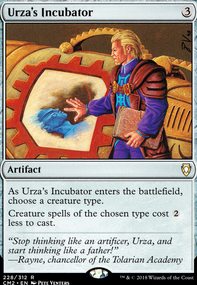 Only Ashnod's would give you infinite colourless mana, while only Phyrexian might not give you infinite mana (+1 mana, -1 mana for copy). With both, you have infinite coloured mana and can play anything in your hand/draw/deck/graveyard/tutor (depens what else is there). But of course that is in many cases overkill, when the first combo with infinite anything is already enough.I really like your card choices, well chosen, and will certainly come again to look for improving my deck, if it will be necessary. 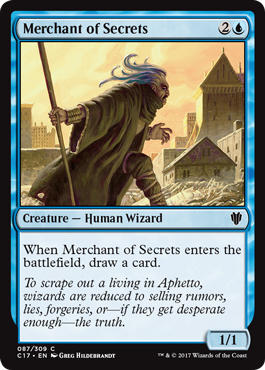 well, except Merchant of Secrets. 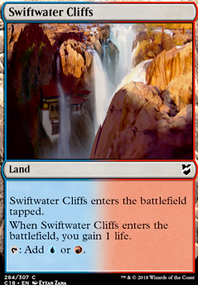 It's just worse than Sea Gate Oracle in every way, that's one thing I can't stand. A fun but weaker card, a situational card, all not the best draws, but give me a card that is just plain worse than that other possible card, I hate that. 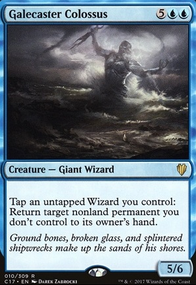 Venser, Shaper Savant is an amazing card in Inalla and even better since you're doing the Paradox Engine thing. Assuming you have enough mana to cast him and pay for Inalla'ss ability you can return all of your opponent's cards to their hand.. Cast Venser. Venser enters triggering Inalla and himself. Resolve Venser returning himself then resolve Inalla creating a venser token to return whatever. Yeah you would have to sacrifice the token if you do it again. I Have only been able to do it once but it was great. Ashnod's Altar and bloodline necromancer gives you infinite Bloodline Necromancers and colorless mana. With Ashnod's Altar in play Cast Bloodline Necromancer.Bloodline Necromancer enters triggering Inalla and itself.Resolve Bloodline Necromancer (not relevant) then sacrifice it to Ashnod's Altar. 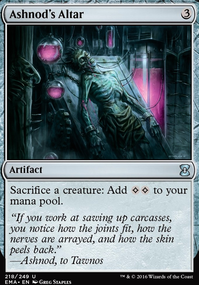 Use one of the mana to pay for Inalla creating a token.Token enters targeting the Bloodline Necromancer in the graveyard. (Resolving the token Bloodline Necromancer is relevant to keep the combo going)Then repeat. I like using this combo with Alchemist's Apprentice or Merchant of Secrets in the graveyard. Copy an instant or sorcery with Dualcaster Mage. Sacrifice it to the Ashnod's Altar. Then cast it through Havengul Lich before the original spell resolves.